Over thirty years ago a seed was planted. It was February 1979. The choir director at Jones Memorial United Methodist Church asked four men from the Chancel Choir to sing as a quartet as part of the Winter Camp Meeting style services. He assisted them in preparing a Southern Gospel style piece. They worked hard, as this was unlike anything they had ever done before. The Sunday came, and along with it, a very bad snow and ice storm. Sunday services in the Atlanta area were called off. But the men kept practicing and later that month they sang their song. They learned that they loved the close harmony of the Southern Gospel style, and from that seed, God placed a desire and calling on their hearts which began The Jonesmen Quartet. 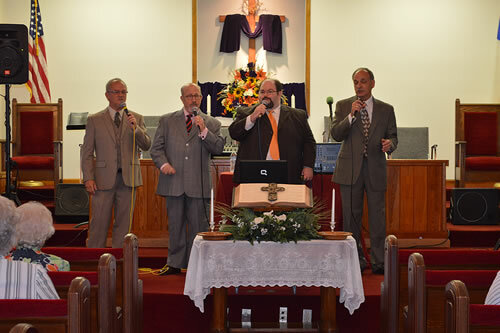 The quartet has a rich heritage of dedicated gospel singers who loved the ministry. Two of the original four - Walter Sheppard, lead, and Steve White, bass - have been with the group since the beginning. Paul Willis was the original tenor and sang until 1987, then later rejoined the group in July 2006 and sang until he retired in 2013. Larry Alberts came on board in 1982 and sang with the group until his recent retirement in 2017. Ronnie Wang, who had played drums with the group, took over the tenor part in 1988. Phil Guptill and Chad Sheppard served as the sound technicians and sang the other parts when someone was out. Altogether, there were a total of 13 other men who were a part of the ministry. The group today includes Walter Sheppard (lead), Steve White (bass), Ronnie Wang (tenor) and Chad Sheppard (baritone). As far as musical accompaniment, the group used piano accompaniment in the beginning, then later added two guitars, keyboard, and drums, but they found that trying to get ten men going in the same direction at the same time was often difficult, so slowly and reluctantly they switched to singing with accompaniment tracks. With that, their ministry really blossomed. The Jonesmen feel their purpose is to share their love of Jesus through their music. They never require a fee for singing and will sing anytime their schedules permit. They sing in many denominational churches of varied sizes - for worship services, programs, banquets, retreats, at camp meetings, nursing homes, homeless shelters, jails, for civic organizations, benefits for individuals and organizations. They even sang at the Georgia Dome for the North Georgia Conference of the Methodist Church for Vision 2000 and again in Athens. Although they have sung in many churches throughout the Metro Atlanta area, their ministry has also taken them throughout the states of Georgia, Alabama, Tennessee, Florida, South Carolina and Illinois. Now after 38 years of ministry, their schedules are busier than ever. They love to poke good-natured fun at each other, showing you can laugh and be a Christian! These men have become like brothers. They have been through many good and bad times, always being there for each other. They have watched their children grow up. They have suffered the loss of parents. Professions have changed. Health crises have challenged them from time to time. Some periods the Jonesmen have had to slow their singing commitments down a bit, but the Lord has proved time and again that He isn't finished with them yet. The members have changed over the years but their purpose has stayed the same. All praise and honor to our Lord!